A plant is “succulent” if it stores water in fleshy leaves and stems in order to withstand periods of drought. Cultivate species native to arid climates (the majority) in warm, sunny areas of your garden, in mounded, fast-draining soil. Protect from prolonged dampness, soggy soil, and frost. Soil: Succulents are unfussy about soil providing it drains well. Amend garden soil and potting mixes 1/3 to 1/2 with pumice, which aerates the soil, provides trace minerals, and absorbs excess moisture. Or simply use a commercial cactus mix. Food: Dose potted succulents with half-strength liquid fertilizer in spring as plants awaken from dormancy. 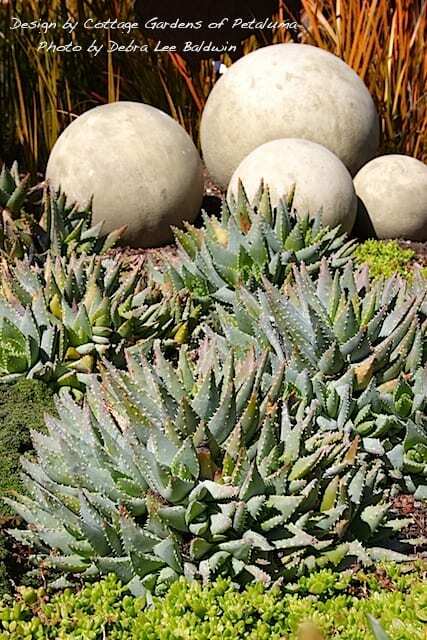 Landscape succulents don’t need feeding, but will be more lush and grow more rapidly if given a balanced granular fertilizer. Apply in late winter or early spring before a rainstorm. Sun: Give at least three hours daily to maintain plant symmetry and color and to encourage flowering. Protect rosette succulents (such as echeverias) from intense afternoon sun in summer. Haworthias and sansevierias can’t tolerate full sun but are good indoor or shade succulents. Air circulation is important to prevent insect infestations. Watch for mealy bugs in leaf axils and aphids on flower buds. Spray with dilute rubbing alcohol or treat with horticultural soap or oil. Temperature: Most succulents are frost-tender. Although they can tolerate temps down to freezing (32 degrees) and in excess of 90 (if shaded), between 40 and 80 degrees is ideal.